BRITAIN may have saved Europe from herself in two world wars in the 20th century but today Brussels politicians effectively said the UK had no place in the future defence of the continent and prepared to KICK OUT key military staff. EU chiefs have told UK military staff that they will not have their secondments to Brussels automatically renewed after Brexit – effectively sticking two fingers up to British overtures towards a common and collaborative military and defence solution for Europe. EU and UK advisers are discussing foreign policy co-operation in talks this week but the warning that British secondments will end after Brexit seemingly makes Brussels line clear. 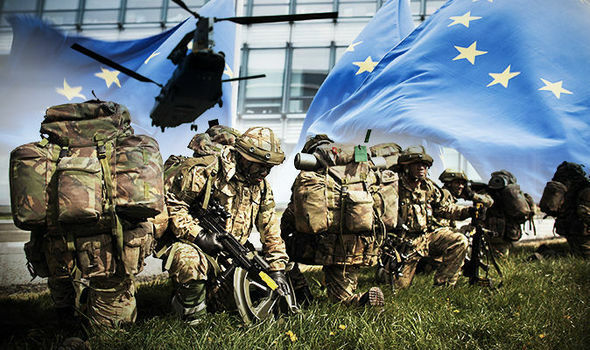 At present 14 British personnel are seconded to Brussels – 13 serve as EU military staff while one is working in the crisis management and planning directorate of the European External Action Service. Britain has similar arrangements with the USA and officials argue it is in the interests of European security that the system is maintained post-Brexit. The Ministry of Defence said British secondments will now be considered by the European Commission on a case-by-case basis – but the current fierce row over the Galileo satellite program which German wants Britain axed from for security reasons does not bode well. The department added that there were “challenges surrounding new applications and extensions” of secondments post Brexit. A senior EU official indicated that the idea of British officials being seconded onto EU bodies would require major political upheaval and rule changes and as such was a non-starter. Earlier this week Air Chief Marshal Sir Stuart Peach, the chief of the UK defence staff, urged negotiators to find some common ground over another hotly-contested military project the European Defence Fund. He said: “At times like this the military to military relationships matter more than ever.